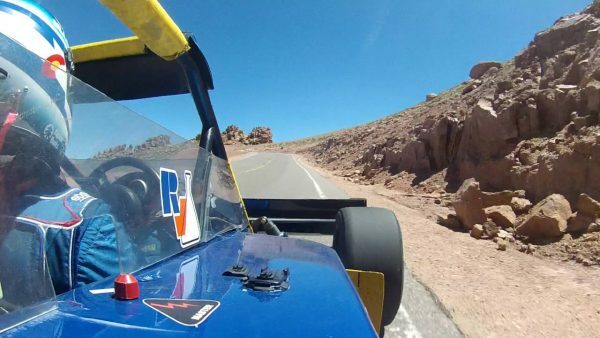 The legendary Pike’s Peak Hill Climb has been the background theme for pretty much all of my ill-advised motorsport adventures. It comes up as a reference for how to properly drive by the seat of your pants whenever I’ve found myself traveling a little bit or way too fast on a windy dirt road up a hill. The race, also known as the Race to the Clouds, first held in 1916, runs to the summit of the 4,720 foot mountain in Colorado, and only since 2011 has the road been entirely paved. A collection of machines run the race – from trophy trucks to quads to formula offroad. Every time I reference the race, I present my anecdotal information as if it’s scholarly knowledge for how to properly bomb up a hill. It all started on a camping trip to Four Peaks in Arizona. I was 15, riding up in a Dually with a friend and our dads. Chris’ dad, Lance, was running maybe 30 mph on the road, taking the tight turns within inches of the edge, explaining to us, quite casually, how the Pike’s Peak racers will run straight to the outside of the turn, and then whip the wheel not in, but out, wrenching it back at the last second in order to swing the back end out, creating a pivot at the turn that essentially throws the car around the corner. This, I found fascinating. With each turn, we were inches from disaster, but it appeared we had a solid command of the physics involved. That we were running mostly on luck was likely more accurate. Fast forward 10 years. It was at night on a dirt road in the Superstition Mountains, this time in my 1985 Toyota MR2, where myself and my friend John Burg, running around 60 mph, again extolled our novice and probably incorrect knowledge of the finesse and skill of the Pikes Peak racers. There, in the dark, the road bathed only in headlight’s while Steve Miller’s “Wild Mountain Honey” wafted from the tape deck, I held court with John on how the Pike’s peak racers run straight to the outside of the turn, and then whip the wheel not in, but out, wrenching it back at the last second in order to swing the back end out, creating a pivot at the turn that essentially throws the car around the corner. The MR2 caught air more than a few times, sometimes, as I remember it, actually turning in mid air. Think of that, while that song filled the air, that little car bouncing and skidding off the packed dirt road, the two of us calm and excited at the same time. And it was all because I imagined, due to an experience when I was 15, that i knew how to run a car at speed on a mountain road. It makes me wonder where Lance learned how to do it. And where the guy who taught him did And so on. Here’s to speed. And mountains. And Steve Miller.